Set includes pre-mitered deck components to complete a 90-degree right angle. 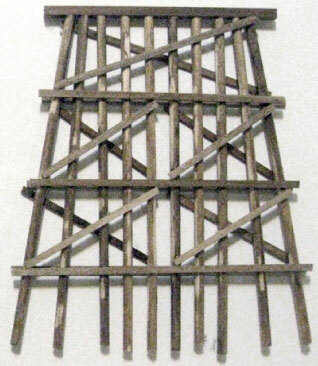 Nine (9) trestle bents are required for proper structural support. (Not included - Sold Separately!) Designed for GarGraves 42" radius curves and all 3-rail flex-tracks. Includes deck components and 12 stringer braces. **PLEASE NOTE: THESE ARE CUT TO ORDER. PLEASE DISREGARD "OUT OF STOCK" NOTATION. Set includes pre-mitered deck components to complete a 90-degree right angle. 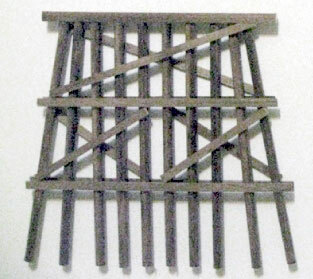 Twenty (20) trestle bents are required for proper structural support placed at 4-1/2" distance apart. (Bents Not Included. Sold Separately!) Designed for GarGraves 72" wide radius curves and all 3-rail flex-tracks. 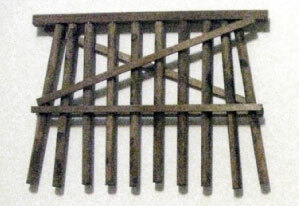 Includes five deck components and 24 stringer braces. **PLEASE NOTE: THESE ARE CUT TO ORDER. PLEASE DISREGARD "OUT OF STOCK" NOTATION. O 12" PREWEATHERED STRINGERS/25 PCS.